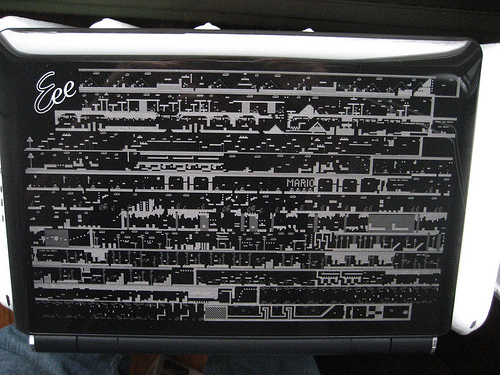 As discovered by the blogosphere at large several weeks ago, I decided to tattoo my 10" Eee PC laptop with an homage to classic gaming cartography. 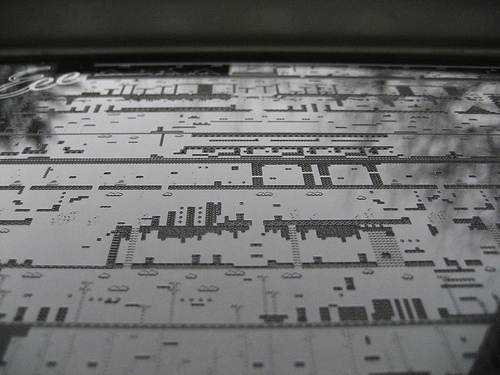 The design is the complete level layout from Super Mario Land ( Game Boy ), from level 1-1 all the way to the climactic battle with Tatanga in the clouds at the end of 4-3. If you like, you can download the source for the design here on Thingiverse. This was made possible with the laser cutter at NYC Resistor in Brooklyn, where you can go to get your laptop etched too! Check below the cut for some more photos of the whole thing. I would like to take a moment to say that I've always been bothered by the "Oh! Daisy" punctuation. It makes me feel like Mario is surprised to find her there, like their running into each other was simply a coincidence. I always assumed he was saying "OH! 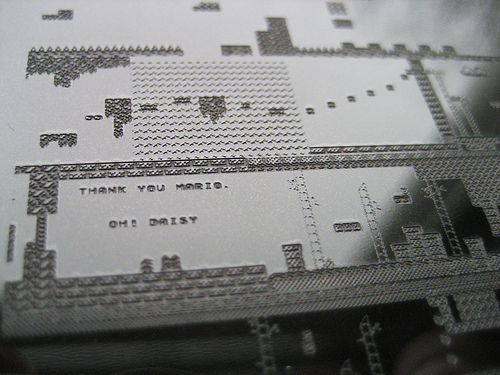 DAISY" because she turns into a monster the first three times you get to her. But I think the text comes up before she actually changes, so who knows what they were thinking. In any case, it's really weird punctuation. lol.. just think of any of the first person mario games.. like Super Mario 64.. Mario's always like Ohhhh!! !